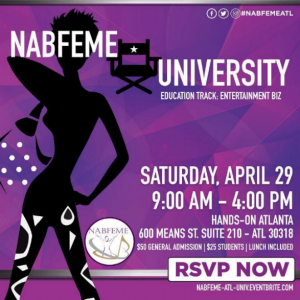 Atlanta, GA – On April 29, 2017, the National Association of Black Females in Media and Entertainment NABFEME Atlanta Chapter will host NABFEME University kicking off their first series of events slated for 2017 in effort to fund the organization’s scholarship fund. Taking place from 9:00am-4:00pm at Hands on Atlanta located at 600 Means St. Suite 210, Atlanta, GA 30318, NABFEME University will present leading executives in television, radio, film, PR, sports and business. Each track consists of 1-hour workshops geared towards preparing women with tactical strategies for career growth and how to respond to current trends in the entertainment industry. The event is open to all women, men, students, seasoned professionals and anyone who has interest in the film/TV/radio/ and media technology. NABFEME University will prepare attendees to take their next steps in careers and business. This event was designed as Education 2.0 or 3.0 to get to the heart of what attendees will need to know to be successful. Ticket prices range from $25-$50. Vendor opportunities are now available. For more information email zinathedirector@aol.com. Additional information about NABFEME University is available at https://www.eventbrite.com/e/nabfeme-university-tickets-32728319284. Join the conversation by using hash tags #NABFEMEATL and #NABFEMEU2017. For media inquiries please contact Katrina Highsmith at Khighsmih@kh2pr.com.